In anticipation of this summer’s biggest blockbuster films, the world watched trailers for The Amazing Spider-Man and The Dark Knight Rises over 100 million times. With all of the fanfare surrounding these superheros, we wondered who would win if they squared off against each other in a good old fashioned popularity contest. Would Gotham’s hero rise against the amazing webslinger? Would Peter Parker get the best of Bruce Wayne? We found some really interesting data when we looked at global searches for “Spiderman” and “Batman” videos in the weeks leading up to each film’s box office debut. See the graphs below to discover which superhero was the most popular among fans. Global searches for “Spiderman” (red) snuck ahead of “Batman” (blue) by just a bit when The Amazing Spider-Man hit theaters on July 3. 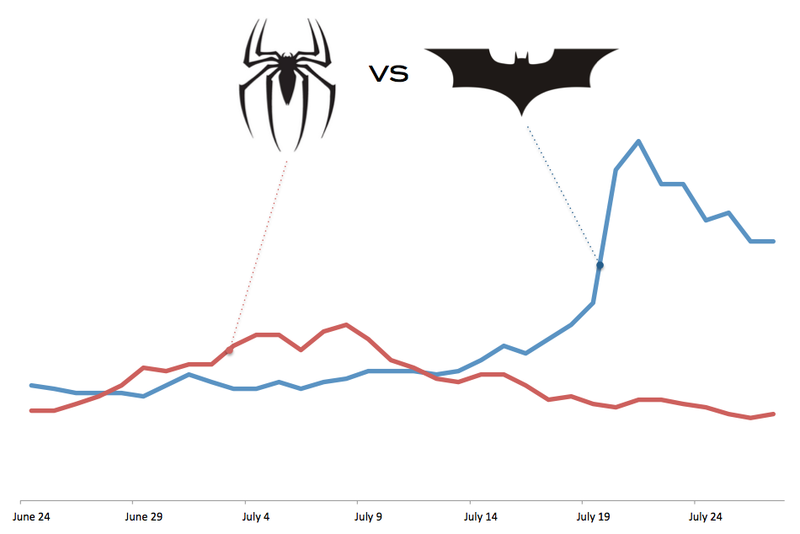 But search interest in the caped crusader significantly overtook Spidey after The Dark Knight Rises premiered on the July 20. India is the only country where "Spiderman" drew more search interest than "Batman" -- and that’s likely due to Bollywood star Irrfan Khan’s role as Dr. Ratha. So there it is - Batman wins over Spider-Man. But if the data doesn't do it for you, here's extremely rare footage of the two superheroes duking it out for all to see.